ISBN 0769212360. 9x12 inches. English. This book is designed to follow logically the Primer Level, and continues to present attractive pieces and etudes. 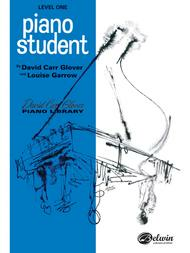 It leads the student slowly, step by step, into a higher level of music study. Materials correlated with "The Piano Student" - Level" include: Lesson Practice Book, Piano Theory, Piano Technic, 30 Note Spelling Lessons, Piano Repertoire, The Church Musician, Sacred Music, Chords and Keys, Piano Duets, Jazz on 88, and others.